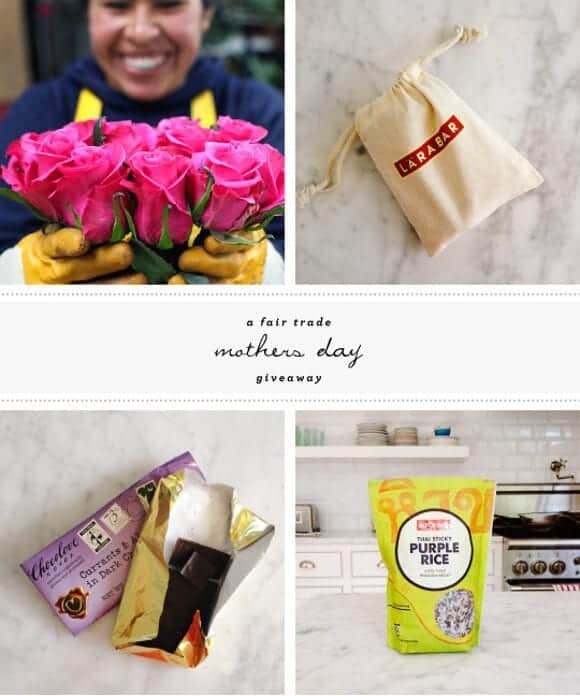 This weekend, celebrate Mother’s Day the Fair Trade way. When you buy your mom chocolate, coffee, or flowers be sure to look for the Fair Trade Certified logo… you’ll be helping mothers and families in developing countries earn livable wages and ensure safe working conditions. Fair Trade is a global movement to alleviate poverty in the developing world, while ensuring consumers quality products that improve lives and protect the environment. Everyday purchases that bear the Fair Trade Certified™ logo come from farmers and workers in the developing world who are justly compensated, allowing them to build sustainable businesses that positively influence their communities. Fair Trade is sending one lucky winner a box of goodies, many of which were made by women-only cooperatives. The box includes: Choice Tea, Allegro Coffee, Alter Eco Thai Sticky Purple Rice, a Chocolove Chocolate bar, a bag of Larabars, and a coupon for Iced Bhakti Chai tea. My mom isn’t just a parent–she’s a friend, too, and she’s one of my favorite people to spend time with. My Mum forgives me when I mess up. I love that my mom has gone through so much, yet she continues to stay positive and inspirational. My mom taught me how to appreciate art and nature and I will always be grateful for that. My mom always knows how to pamper me! my mom is the most selfless person i know. My mom cares so selflessly about everyone else! She has been through such a tough year, between car accidents, bike accidents and just random injuries in general (welcome to my family!) and she has always care for others more than herself. She amazes me every day, and I can’t wait to celebrate HER Sunday! My mom makes me laugh like no one else can. Last year she had an aneurysm and a few months ago she found out she has Crohn’s Disease and a large mass growing in her stomach. Through it all, she stayed strong and kept all of us laughing. Both her surgeries were a success and I’m just so glad I still have my mom here with me. My mom has been the one person who I could always count on to be there for me and brighten my day. My dad does double duty in the parenting department these days and I happen to think he is fabulous @ it all! My mom has become a close friend the older I have gotten. In my teens we bickered because we are so similar and it drove me crazy but now in my late 20’s our relationship is so close because we ‘get each other’ on a deep level. She is encouraging, funny and supportive. My mother is not only warm and loving, but a woman to respect. Now that my sister and I are both in college, she is training to be part of Doctors Without Borders. She has already traveled to Cambodia and Myanmar on medical missions. What always awes me is my mother’s capacity to care for not only my family, but also her devotion and eagerness to care for all people around the world. My mom is amazing – she’s been there for me every single time I’ve needed her. She somehow always knows just the right thing to say! My mom is the most selfless person I know. Though she is too humble to ever realize it, she has provided her children the perfect example of love, kindness, and loyalty. She has also taught me what it means to be a true friend and the importance of maintaining lifelong friendships, through thick and thin. My mother is the perfect example of support. She puts the needs of others (both friends and family) before herself. If a friend is going through a tough time, she is the first to express her support and be there in any way she can. She has taught me so much about what it means to be a true friend. My mom loves unconditionally and without fail. I hope that I can be as patient and understanding with my own children (someday) as she has been with me and my siblings. She is truly the best. My mom wasn’t always there for me when I was little. She was in an unhappy marriage and had to compete with the affection that my brother and I gave my dad. As I got older and got married I realized that she did what she could. She knows her faults and has made up for lost time by being the best grandmother to 4 granddaughters. Despite being 70 she still walks NYC with my nieces so they can shop and see the city. She is amazing. It took me quite a long time to understand and appreciate her. I love her with all my heart. It akes a strong person to realize your faults and change. My mom is the sweetest ever! Now that I am a mom, she has been a huge support while respecting boundaries. My mom has always been the one to advocate for me and listen to me. I call her almost everyday and she almost always answers….no matter what she is doing. I’m thankful she is my mom! My mom works harder than anyone I know, but she’ll drop anything and everything if I need her for something. And she’s an amazing gardener! Thanks for the giveaway! I love my mom. We both have very different views on tons of things (boys, curfews, even food!). It’s kind of funny, since we’re not that close at all since our jobs don’t allow us to spend as much time as we’d like with each other. But no matter how mad we get at each other, she’s always willing to welcome me with open arms. My Mom had major surgery this month and took it like a champ! I am so proud of her! In almost all of my own faults, to my most wonderful traits, up to the shape of my lips and each of my second toes (which are slightly longer than the first), I see my mother in me. She has helped to shape the person I am today, and the person I will continue to become throughout my life.. And I simply cannot imagine my life without her. My mom is the only person who has ever really gotten me. Sometimes I think she knows me better than I know myself. Every day I wonder how I got so lucky to have a mother that I can count on for literally everything. I learned to be a great cook from my mom! My mom is the most considerate and caring person I know. My mom is the best listener : ). My mom is so supportive of me… I can’t imagine getting to where I am now without her! She has this ability to turn any less-than-stellar situation into a positive one! I love my mother, mom, mommy and best friend! She and I live on opposite sides of California but connect multiple days out of the week to say hello, exchange recipes, de-stress and laugh. My mother is beautiful, strong, hardworking and loves unconditionally. I strive to have half her energy when I am 65! My mom put so much of herself into raising us the right way, even (or especially when) we didn’t appreciate it. She is amazing and I hope to be half the mom she is! While she is the shortest person I know, my mom is also the tallest person I know. She is taller than anyone, bigger in heart and soul, lover of laughter, sunlight and me! Miss my Mom every day- I lost her so young – she never passed judgement on anyone and was my best friend. After mothering 5 kids (all 2 years apart) successfully through the trials and tribulations of adolescence and college, my mom decided to do it ALL over again with two kids in foster care. I sincerely hope I have the gumption she’s got when I am in my fifties. She sets the bar high while still kickin’ it humble style. Love her! Hmm… There are so many things to say about my mother, that it is hard to say just one! I think that one of the most important things that I love about my mom is her constant support. I have been up and down in the recent years, dealing with friend problems, body image, and fitting in with my peers. My mom has been my rock through it all. She goes out with me when I am in need of a girl’s night and stays in when the weather (which was dreary and cold all through the winter days) got the best of me. Thanks mom, for all that you do. My mom loves to cook and is a very healthy, light eater. She has taught me to enjoy food with my eyes & nose just as much as my tastebuds. My mom is incredibly graceful. My mom is the strongest, most caring woman I have ever met! She is a 20 year stroke survivor who has maintained her independence in her own home! I am so proud of my mom! She has worked with abused children for more than 21 years, and last year she won Volunteer of the Year from the City of Houston. She’s a wonderful friend and a great advocate for children. I’m getting married next month and I can honestly say that I could not have pulled it off without my mom! Like with everything else in my life, she has been there every step of the way from physical help and getting things done, to mental support when problems arose. She has been my right hand and I cannot thank her enough! My mommy is my sunshine and my encourager. She believes in me more than I believe in myself. She is my hero, and all my life long I strive to be just like her. She is the most selfless and brave person I have ever known. My mom has kicked breast cancer in the face TWICE in the last year. Boo.ya. Aww. My mom would love something like this. She’s always so supportive of those in need and those stretching to overcome obstacles. What a wonderful way to support women from around the world! My mom is my creative muse and my confidant. I don’t imagine I’m eligible to enter the giveaway as I’m in England but I don’t need an excuse to sing my Mum’s praises! Thank you, dear Mum, for teaching me to eat well, dress well and cook well. And loving me even when I fail to do them all. My mom is one of the strongest and most independent women I have known. She has overcome so much from her younger years. Among many things, she taught me how to stand up for myself and be strong while being kind at the same time. I love you mom! I was lucky to be raised by an amazing women who taught all my sisters and I to be strong and independent thinkers. As I now raise my own children, I appreciate her words of wisdom even more. I can honestly say I have the most supportive mother I know, no matter what new adventure I want to try out or life changing decision I’m making she always has my back one hundred percent. She has never made me feel as though I have done wrong even when I make mistakes, she realizes that this life is a journey and sometime I have to take detours on the way to my destination. She is great and I am extremely grateful. My mother has a gift; everyone she meets feels comfortable and welcome in her presence. She’s not an extraordinary housekeeper (though she puts me to shame) and doesn’t have a home that looks like it belongs in a magazine, but everyone feels at home in her home. She loves deeply, laughs a lot (even at herself) and is incredibly strong without recognizing it. She gives of herself without realizing the extent of her gift. simple gifts like doing the laundry and cooking a real meal or cleaning the tub. She has been my strength while I’ve dealt with cancer for 7 years, my first teacher in faith and staunchest ally, a force to be reckoned with. She carries joy, and has shared that gift with me. She is so remarkably extraordinary in the most ordinary way possible. my mom knows everything there is to know about being a strong and powerful FEMALE and has inspired me to be the same! My mom always thinks about others first and always remains open-minded about the world. I see myself becoming more and more like my mother. I am a very fortunate woman. My mom is the most compassionate and selfless person I have ever known! She is amazing and I’m so thankful I have her in my life! My mom is always here for me no matter what! My mom organized 9 moves for our family of 4 between the time I was born and when I got out of high school. Each time, she made us a wonderful home in our new locale and dived right into the community, schools, etc. As a grown-up myself who has moved a few times, I have the utmost admiration and respect for how hard that was for her (and in the pre-internet and pre-email/texting days, much harder than now) and how gracefully she handled it all. My mother is so full of energy and so thoughtful. She is constantly thinking of and putting others ahead of herself. I’m constantly impressed by her depth of knowledge and her innate duty to serve the community. My mom is a room-brightener. She makes everyone she’s around happy! My mother is the smartest, and most caring woman I have ever met. I found the perfect Mother’s Day card this year: Mom, I hope to be half as brilliant, beautiful, and generous as you are but twice as good at using the Internet. My mom taught me how to never apologize for who I am. She’s constantly learning new things and improving herself, and I love that about her! My mom is my best friend and absolutely wonderful. She’s an incredible baker, used to run a catering business, loves food and art and books. She sends me care packages at college with rancho gordo beans, fleur de sel, Green and Black chocolate, and dried persimmons. We’re going to Sons and Daughters in SF for Mother’s Day and I can’t wait. I gave birth to our first child, Adam on 30 April. My mom came to stay with us for a while to give a helping hand. I can’t thank her enough how much she does for us. She is absolutely amazing!!! My mom is so supportive of me, and I think it’s because of her that I adore food so much. We share our love of food together by exploring, creating, and tweaking recipes, discovering new restaurants, and of course, eating and savoring all of the deliciousness (the best part!). My mom has shown me what it takes to be a woman and a mother myself- strength, courage, independence, love, faith, and wine! I’m adopted and my mother never made me feel any less than 100% hers. My mom showed me how important it is to eat healthy. Well, my mom has won Best Mom Ever 28 years in a row, so, you can be sure she really is the best. My mom inspired me to sew and to cook. She was cooking dinner up to the last days of her life. My mom is a selfless, strong woman. She is my best friend. My mom is always there – no matter what may happen. My mom has saved my life more times than I count. I don’t know where I’d be without her. I’d do anything for her. My mom is my best friend and my number one fan. Case in point: this Mother’s Day she plans to drive for several hours just to watch me compete for a few short minutes. If that’s not love, I don’t know what is. My mom taught me to sew…..also to find my way without a family. My mom is my best friend and always will be! My mom is a very thoughtful & caring person, and the best grandmother to my kids. I love that I can talk about anything with my mom! I love my mom! Everyday should be Mother’s Day for her! My mom is the most generous person I’ve ever met. She’s also smart, caring, and taught me to follow my dreams. My mom is still working hard to raise my youngest siblings, she’s been parenting for 24 years and has at least 8 more years of kids in the house. I admire her patience and love through it all! My mom has been very sick for a little over a month now. She is a fighter and is on her way to recovery. I’m extra thankful for her this Mother’s Day! My mom passed away 15 years ago. She was a lover of life and never let go of her spirited ways. She was a painter of paint-by-numbers, registered nurse, belly dancer and singer with our player piano. She dug up a little rock garden in our suburban Detroit home and put in a plastic pool with goldfish in it. She took a burlap bag and embroidered away all the letters on it to create a beautiful Native American Halloween costume. She married my stepfather a month after meeting him and raised seven children, loving every minute. I miss her forever. My mom died suddenly 11 years ago. Still love and appreciate her more than ever. Every day I hear her voice and am reminded with a smile of things we shared. My mom will go to ten different stores, just to make sure she has the perfect gift for someone. It is that desire to find the best for someone she loves, that I love about her. My mother is the most amazing and strong woman I know. She’s been an example and role model to me in many ways. I love that my mom has an uncanny ability to read a situation, figure out how best to help, and do it sometimes without your even knowing it. My mom makes the best sandwiches! Cool blog! My mom used to sing me to sleep with I was a kid, and read all the Ramona books aloud to me. I now do that to my 3 boys! She is a good example. I love this blog! The recipes are fab and the style is divine. My mom knows what she wants & perserveres. I can only hope to be as strong and graceful as my mother when I become one—she is my constant inspiration . . .
My Mother is one of the strongest, smartest women I know. She was one of the very first people (and the first woman) in our family to leave the very tiny rural town in North Carolina at 18 and moved to Miami Beach during the swinging 60s. She put herself through nursing school and ended up traveling the world. My mother is the strongest and most inspiring woman I know. Her father died when she was 17 years old. To help support her family, she had to take evening college classes and get a job while she was still in high school. I’ve learned so much from her and couldn’t be more grateful to have an influence like her in my life. My mother is my best friend. I don’t know what, or who, I would be without her. My mom makes the everyday special. I live 6 hours away from my mom, but she is the greatest. My mom has always been the person that took care of everyone, and also held my family together. When my dad passed away almost 5 years ago, my mom was totally rocked- it was out of the blue. Through the last few years, everyone in my family has had to adapt and to support each other. When my dad died, my mom for the first time in my life seemed vulnerable. She needed me, and my brother, because her life as she knew it was gone. She has really worked to adapt, to remember who she is as an individual, and also to adapt to her new role as grandma (!) to my nephew. This is the future of my family, but my mom is, of course, at the very heart of it all. I love you Mom, Happy Mother’s Day!!! My mom is always there for me when i need her. My mom has known me since a very young age and honestly has grown from mother into best friend. I could never thank her enough for all she sacrificed to make the life i live now a reality so i will pay homage to her with a variety of flowers. My mom rocks! Her selfless love and and makes her both just my mother, but a best friend too! My mum is amazing because she had the strength and courage to keep our family ticking after my father passed away when I was young. And for that I am eternally grateful. My mom is an amazing woman. She didn’t blink an eye when I declared at age 9 that I was a vegetarian, and she has always been a great (and healthy!) cook. She is adventurous and generous and open–with food and with life! I used to think my mom wore the wackiest clothes, but as I’ve gotten older, I’ve come to appreciate and emulate her sense of style, because she wears what she likes and does it so well. It’s how she wants me to live my life too, doing what you want in life without worrying what others think of it; mixing the conventional and the wild. I admire my Mom because she’s a great chef and never gets tired of cooking and baking. She rather looks after everyone else than herself and sometimes I have to remind her about that. My mom is my very best friend. I don’t know what I would every do without her. My mom has been my rock and my cheerleader for my whole life. She’s not just a mother, but a role model, a super hero, and a best friend. My mom inspires me to push myself in school and not give up on my goals. She’s a strong, intelligent and successful woman that I aspire to be like. My stepmom has been there for me, no matter what, since coming into my life. My mom has been there every step of the way as I’ve gone through becoming a mother just this past March- she’s a lifesaver and is always just a phone call away. She took time off of work to come stay with my husband and I to help us settle in as parents- and she brought loads of food! My mom has always been supportive of me no matter what crazy idea I get or new path I decide to forge. She lets me be me, and she loves me unconditionally. She’s the best mom a girl could ask. Every day, I am thankful for my wonderful mom! She’s a courageous, selfless woman who still manages to make a mean chocolate chip cookie. I’m lucky enough to have two moms! Both of them are inspiring, compassionate souls whom I look up to. I loved my mom so much and I miss her everyday since she passed. I’m fortunate enough to have a mother in law that is sweet and kind so she makes it a little easier when I need someone. My mom has never pushed me to be anything other than who I am, and I am so so grateful for her love and support. My mother is my rock, inspiration, and biggest supporter. I love her with all my heart and am grateful every day for who she is, what she stands for, and how much love she gives! my mother in law treats me like a daughter, and a friend. How lucky am I? She’s a fighter! Her tenacity helped her kick cancer, and she’s lived every day to the fullest since. My mom is an incredible baker, a great home builder, and full of love for her family. Love you, ma! my mom is the strongest person on earth…and i don’t mean weightlifting. My mom is my hero. My mom is a creative soul. I’m glad she has finally found an outlet. My mom taught me how to be a good friend. My mother is an amazing person who lets me be who I want to be! My sweet momma taught me what loving good food was all about. We don’t spend much time together now (we’re halfway across the country!) but when we do, we spend most of it concocting delicious things in the kitchen and I absolutely love that time! My mom taught me to love travel and appreciate art. She also taught me to be a feminist and to stand up for myself. She is the reason why I value education! Awe I love my mom, she is the best! my mom has always been my biggest fan!